Tough thermofused laminate tops are stain-resistant and easy to clean, yet hard enough to resist dings and chips. The thermofusion process permanently bonds the finish to the board so there is no glue line to delaminate. Table tops are available in your choice of 8 colors. 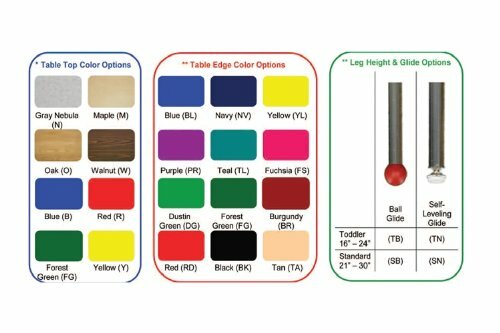 The specially designed molding accents, matching 1½" polypropylene ball glides, and powder-coated finish on the upper portion of the table legs are available in your choice of 15 colors that coordinate with all Mahar storage units and chairs. (Nickel-plated self-leveling glides are also available at an additional charge.) Nickel-plated leg inserts are adjustable in 1" increments to make the table heights accommodating for everyone from preschoolers to adults. 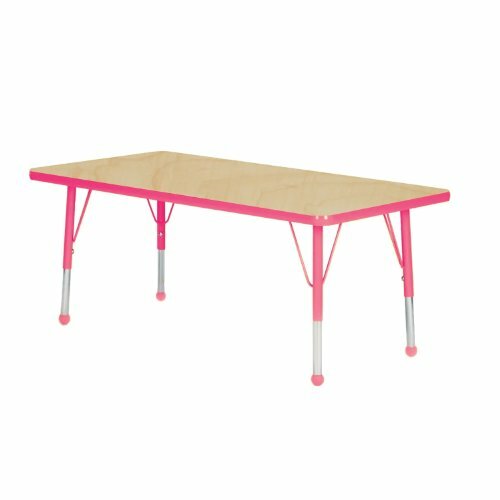 “Toddler” legs adjust the table height from 16" to 24" and “Standard” legs adjust the table height from 21" to 30". Leg design and configuration allows chairs to be placed where you want them. All table tops and legs are proudly made 100% in the U.S.A.